WE ONLY MAKE AND SELL THE BEST QUALITY PRODUCTS! You NEVER have to doubt the products you purchase from Fast50s because we refuse to sell anything not worthy of adult abuse! 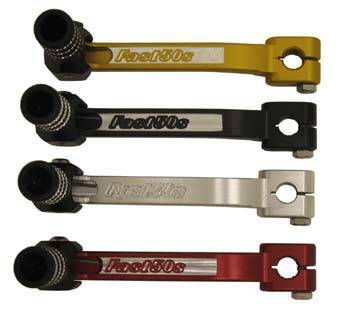 Fast50s Team Issue Shifters are made from high quality aircraft grade aluminum with precision broaching for an exact fit. These shifters will last and are worth EVERY penny. Lighter and STRONGER than OEM levers!! Anodized in your favorite color. Choose in "Make It Your Own" option. Our folding tip has an aggressive knurling to ensure your toe does not slip out from under it. Make your bike look factory with the sweetest shifter out there! We also carry Steel Shifters and Cast Aluminum. Made in America! AKA USA !